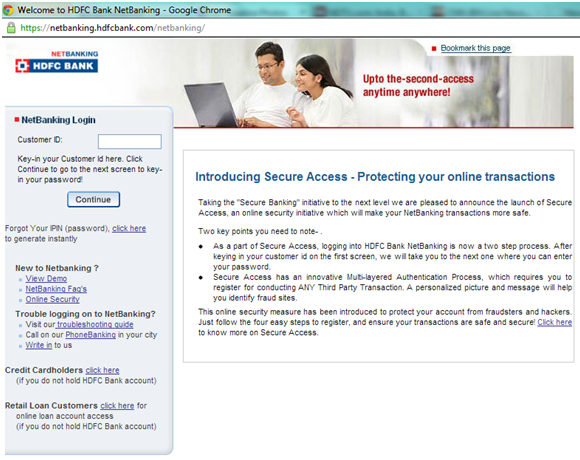 Indian Security Researcher Jiten Jain from Xebia Architects today revealed that one of the Largest Private Banks in India, HDFC Bank’s e-Banking website could be easy target of Unique type of Denial of Service Attack which could result in blocking of e-banking accounts of all its customers. Here is the detailed report of vulnerability submitted by him. 2) User is then taken to the next screen where he is shown his personalized picture and message and asked to enter his IPIN (password). 2) We then setup a phishing portal for HDFC Net banking and created a fake HDFC NetBanking Mobile app and tried it on some people. 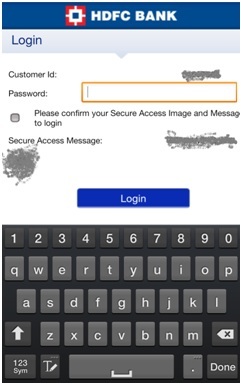 In our fake HDFC mobile application and phishing portal we were able to replicate exactly same Secure Access behavior like on original HDFC website using the database of Customer IDs of NetBanking users and their secure Access image and text we had created earlier. Since our site was showing the same secure Access images and text on entering customer ids we used their security feature to provide more authentic look to our phishing website and Mobile application. The Situation was worse for fake mobile app since Mobile users could not even see the URL, setting aside any chance of doubt in mind of user. Several users trusted our phishing site and mobile app and tried to log in with their passwords. 3) Now in a third Killing step we launched denial of service attack on website the by blocking some user accounts. 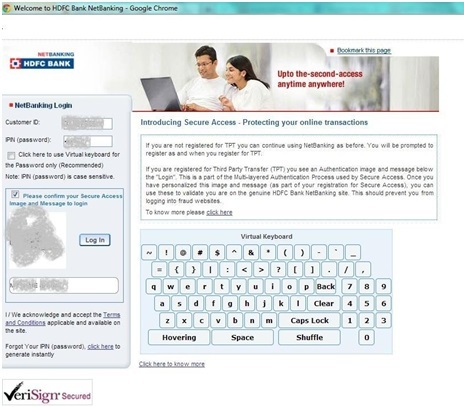 Since Secure Access authentication vulnerability has helped us create the database of customer ids of HDFC NetBanking users we launched another program which simple went on HDFC NetBanking website and provided customer id from our database on HDFC NetBanking login page. While Speaking to “The Hacker News” ,Mr. Jiten disclosed that had shared the above vulnerability report with the HDFC Bank in February itself to provide them ample time to fix the above vulnerability. The report about lacking security on HDFC online banking website is another blow to HDFC Bank which is already facing flak for its shady deals and is currently under a Black Money investigation by Indian Government.